that no longer serves you and focus on what sets your soul on fire. Never stop exploring and start having fun along the way. Because our energy is correlated to the intentions we hold in our heart, it often speaks louder than the words we speak or the actions we take. Why are we feeling the way we do? What are we trying to achieve with the decisions we are making? Do we have a clear picture in our mind about the reasons behind our choices? These kinds of questions can give us some clues about our true intentions and the kind of energy we are giving off. So rather than only focusing on what action steps we need to take next, it is also important to see what our intentions are and what we can give out of those actions. Are we contributing to our own mental and emotional growth as well as the mental and emotional growth in others? Or are we just trying to always come out the winner for the sake of showcasing our power? With every intention comes either a solution or more problems. It is up to us to see whether our intentions are based on negative core beliefs or possibilities for positive growth. Begin to see intention as the starting point of every dream, and understand that intention is more powerful when it comes from a place of self-awareness than if it arises from a place of self-centeredness. Self-centeredness comes from fear and insecurity, which makes it more difficult for us to detach from outcomes. Whereas self-awareness comes from a sense of contentment, which makes it easier for us to not be easily influenced by other people's doubts or criticisms. It's about time we began our new journey from a place of self-awareness, where we are ready to plant our true intentions into the flowering depths of our consciousness, and to start protecting our energy to make room for our dreams to grow. core beliefs or possibilities for positive growth. 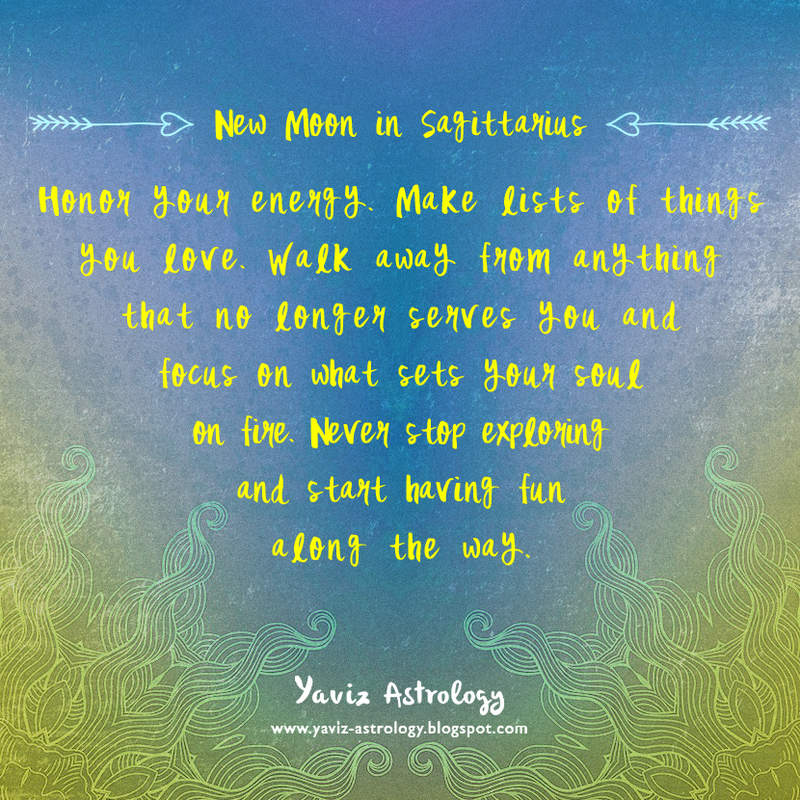 Happy New Moon! The Moon is joining the Sun, Saturn and Mercury in Sagittarius, marking an idealistic and philosophical New Moon in the sign of the restless Centaur. Regardless of internal fears or actual real world barriers, we can start to see the power of sticking to our vision, mission and goal. Remaining positive in the midst of adversity is also highlighted under this New Moon. Even if Saturn's influence has been sobering us up to the reality of our beliefs and aspirations, the presence of the Sun and Mercury in the sign also highlights our creativity and ways we can bring in fresh new ideas, perspectives and inspirations. This is a time to explore the new energy between the present and the future. To stay curious, as well as to trust the process of change and growth. The Moon is forming a square to Neptune, and we may be feeling stuck, and impatient regarding some delays. Instead of feeling overwhelmed, try to get a good night's sleep because sleep deprivation can worsen our anxiety and our ability to think clearly. Do our best to get some rest in between assignments if possible. Retreat and pull back our energy from the outside world as our sensitivity is heightened at this time. The overly busy mind can block us from inner wisdom if we don't step back and rest once in a while. Be open to let dreams surface and ideas to flow through us as we process our emotions. After the break, we may want to make some changes because new epiphanies have a way of arising when we feel rejuvenated and well rested. The Moon is also forming a sextile to Mars and Jupiter, and we are reminded of the importance of shielding ourselves from harsh or negative energy. Shielding ourselves is a way to ensure that our energy stays high and clean, especially if we are working in a harsh environment or interacting with people who tend to be negative. There are many ways we can clear our own energy. One is to visualize a light surrounding us, and affirm, "I am surrounding myself with love and light, and only positivity can penetrate this light." Another way to clear our energy is to take a very warm bath with sea salts, because salt water has the ability to absorb negative energy. Going outside and connecting with nature is also another great way to replenish our energy, because flowers and trees have gentle, loving energy with unique healing properties. With the Moon's trine to Uranus Rx, we are guided once again to ask ourselves: Who do I want to be? Who do I need to be to live out my dreams? What do I need to believe in order to have the life I truly want? We were born with the power to imagine. If we can dream it, we can create it. The future is not set in stone, so allow the power of our creativity to deliver images of what feeds our soul. Clear our inner slate of worries from catastrophizing and awfulizing. Release any residual fear. Then begin envisioning a brand new future.